For the last two months our seaside garden has been ablaze with spring bulbs. Even if I do say so myself, this year’s display has surpassed all others in terms of longevity and flower-power. I put this down to three things: firstly, the best selection of varieties I have ever made; secondly, a plentiful number of good quality bulbs; and thirdly, a mild winter followed by a cold spring, which has prevented the flowers from ageing prematurely. As I write this post I am sitting at the garden table, warmed by hazy sunshine, surrounded by an explosion of sulphur yellow Narcissus “Hawera”, cool white N. “Segovia” and a veritable smorgasbord of flame, gold, bronze, plum and aubergine tulips. Watching them unfurl has been nothing short of thrilling. Apart from a handful of Iris reticulata which failed to produce any flowers, none of my bulbs have disappointed me. But some have surpassed all expectations. We are both agreed that the discovery of the season has been a tulip called “National Velvet”. 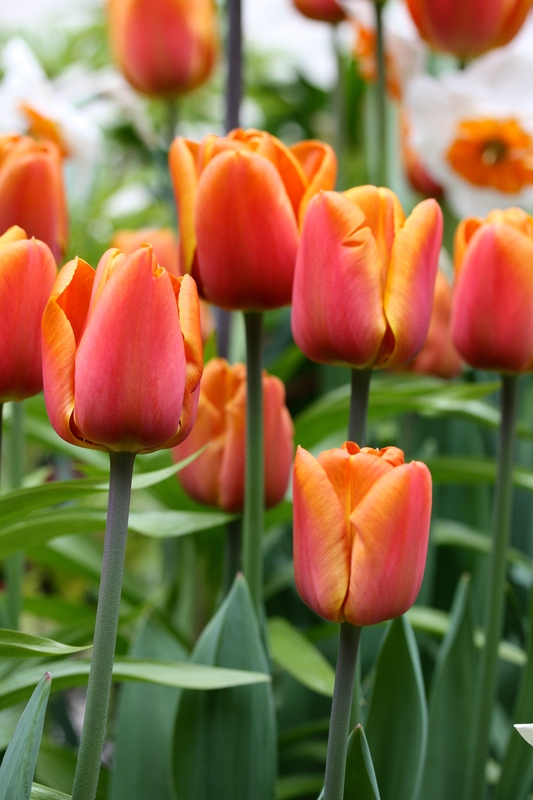 It is one of the Triumph group of tulips which are habitually sturdy, tall singles that make excellent cut flowers. The smooth, lustrous petals are the colour of a glass of Merlot and shimmer like a thoroughbred’s coat after a tough race. Unfortunately I have failed miserably to capture the colour accurately in a photograph. The flowers of T. “National Velvet” look smart and sophisticated against emerald-green foliage, as well as the soft green paintwork of our house. This tulip is going straight back on next year’s order and I suspect it will remain a favourite for many years to come. Biggest surprise of the spring has been T. “Queensday”, a double tulip with neon-orange flowers bright enough to scorch one’s retinas. The need for sunglasses apart, watching the buds of this tulip open to form a champagne coupe of juicy-fruit petals has been joyous. Arranged alongside deep magenta double T. “Anthraciet”, T. “Queensday” has proved a great success and will be back in my bulb theatre again next year. When I posted images of T. “Rococo” in bud they garnered a mixed reaction. In full bloom the flowers have lost nothing of their drama, but have perhaps become a little more palatable. The colour is blood-red with purple, green and orange highlights. The flower stems are neat and compact. I’ll be planting more, for sure. As the first of the tulips begin to fade I am still enjoying three narcissi that have gone on, and on, and on. The first to bloom was N. “Baby Boomer”, a tall, perky, multi-headed daffodil with flowers yellower than yellow. The stems and leaves of N. “Baby Boomer” are so fine and slender they are almost grassy, but no amount of wind has unsettled the delicate shuttlecock of golden flowers which we have enjoyed for a full six weeks. 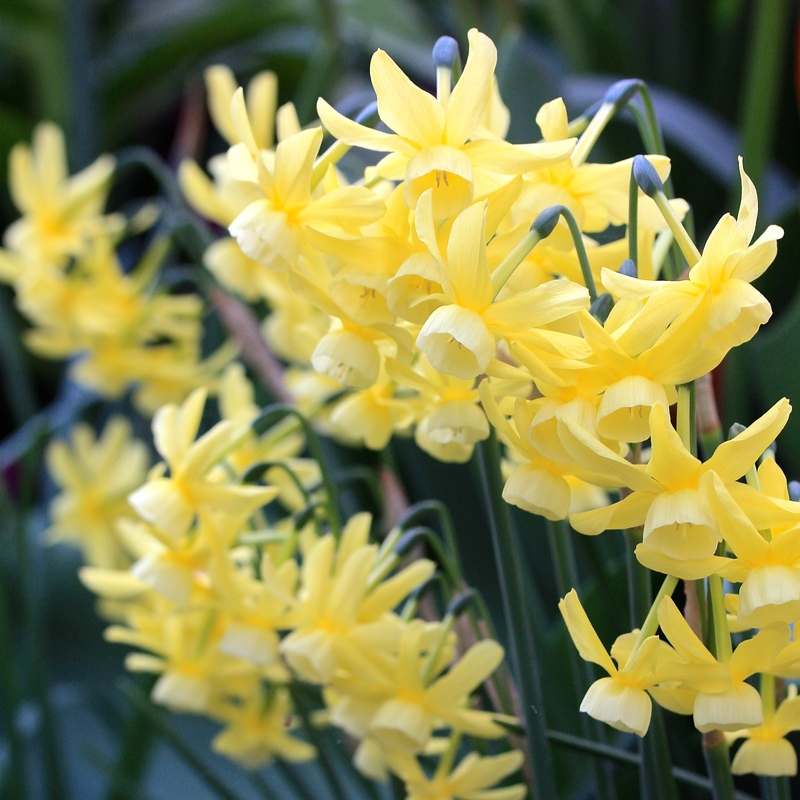 I always buy more bulbs than I have space for, or time to plant, but in the case of Narcissus “Hawera”, cramming 20 bulbs into a 10″ pot proved to be a master stroke. 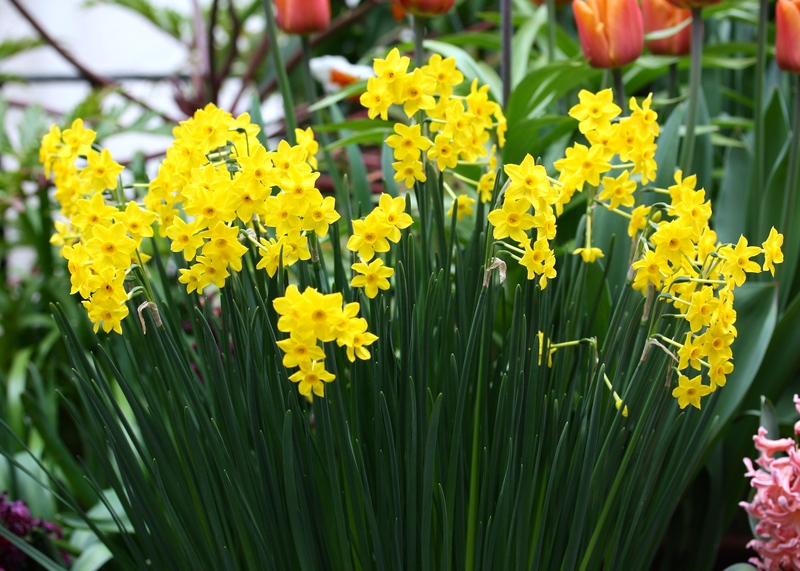 Each bulb has produced 5 or 6 flowering stems, every one terminating in 4 or 5 tiny trumpets. The sense of profusion is quite remarkable. Rather less floriferous, but a welcome break from the rumbustiousness of the other flowers is a little narcissus named “Segovia”. Each stem bears a single flower with ice-white petals arranged around a flattened, buttercream trumpet. Having been disappointed by most of the irises I planted last autumn, I will single out I. “Harmony” and I. “Scent Sational” for praise. The latter lived up to its name by producing plentiful, sweetly fragranced flowers for 2 – 3 weeks, which is good going for an early iris. Meanwhile the fat lady hasn’t quite started to sing in our bulb theatre. Tulipa “Havran” and T. “Tambour Maitre” are only just beginning to colour up and will keep us entertained until Chelsea time. The flowers of T. “Tambour Maitre” are described as “rich red with an overlying touch of smoky-crimson”. They sound divine! This autumn I have resolved to plant multiple pots of the same variety, which will give my display greater rhythm. I will also include more non-bulbous plants, such as euphorbias and ferns, to break up the sea of saturated colour. This is a tough call as it will limit how many new varieties I can experiment with, but my hope is that by late summer our building work will be finished and I will be able to use the garden “next door” to trial new varieties and colour combinations. I would like to experiment more with yellows, whites and pinks for starters. I don’t like to plug particular companies too often in this blog, but I feel indebted to Sarah Raven, firstly for so artfully pulling together the selection of bulbs from which I chose, and secondly for sending me such top-notch bulbs. There is a lot of competition in the bulb world, but Sarah Raven has really cornered the market for gardeners who are looking for unusual, garden-worthy varieties that coordinate perfectly. Perhaps more growers and sellers could take a leaf out of Sarah’s book by curating their range more thoughtfully. For those of you organised enough to be thinking about next year’s display, it will only be two weeks or so until most growers release their 2017 catalogues, just in time for the Chelsea Flower Show. If this seems a bit too soon, at the very least make a note of what’s performed well for you this spring and where there are gaps in your pots and borders. In the age of the mobile phone I find it just as easy to take snaps to remind me of the good, the bad and the ugly. Before spring fades into summer I’d love to hear which flowering bulbs have given you joy or heartache this year and which varieties have risen to the top of your favourites list. What a pity Judy. Darn critters! For once I didn’t use my iPhone for the main images. I forced myself to use my Canon and take “proper” pictures for a change. It took me nearly 100 shots to get 2 or 3 I was vaguely happy with. Oh dear! Hope you’ve had a lovely day there in Oz? It’s beautiful here this morning Helen. I am off out to plant up some pots that will bridge the gap between the bulbs and the dahlias. I’ve got some osteospermum, some nemesias and a couple of bits and bobs, plus cuttings that really need potting on. The town is so busy I may not even set foot beyond the garden gate today! Well, how gorgeous are that lot? As Helen says, I am jealous and envious on every level. So well done Dan. Have been meaning to ask, have you tried planting bulbs in layers? I gave up container planting for a while so I’ve only recently discovered this method. I still can’t quite believe it works but decided to give it a go this year with two types of alliums and chincherinchees. Being a novice I couldn’t quite bring myself to plant them too deep or close but having read further I realise the bulbs can be really quite squashed in together. It will be interesting to see the result next spring. If it does work out, there will be no end of fun choosing the bulbs to layer! Hi Anne. Yes, almost all of my bulbs are planted in layers. It’s the only way I can get the density of flowers I need for my small space. Plus, if different types and varieties are combined this keeps the display in a single pot going for much longer. 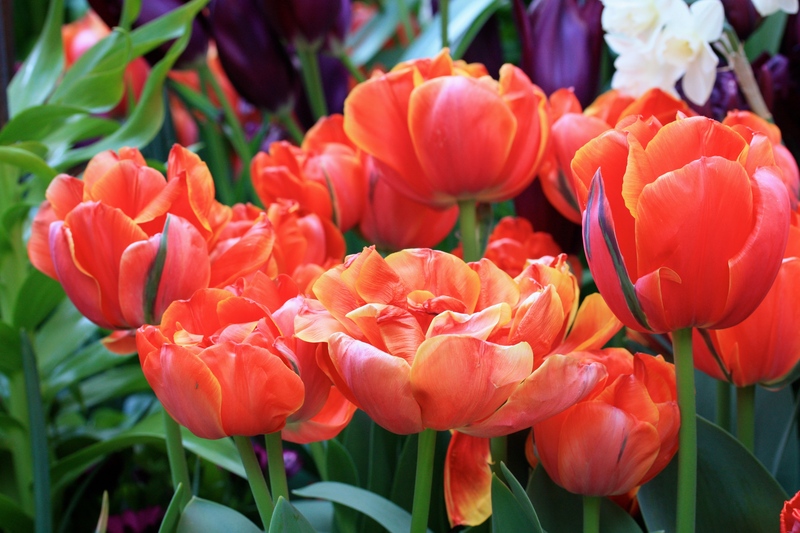 Don’t fret about planting too deeply, the bulbs don’t mind so long as you are using a good compost. Only watch-out is hyacinths, which if planted too many in a pot tend to “heave” towards the surface, displacing compost. I hope you get on well with this method as it works brilliantly for me. That’s a beautiful selection. I will put National Velvet and Brown Sugar on my list for definite. I am having fun with a bright orange peony type called Sunlover this year. It has really cheered the garden up. 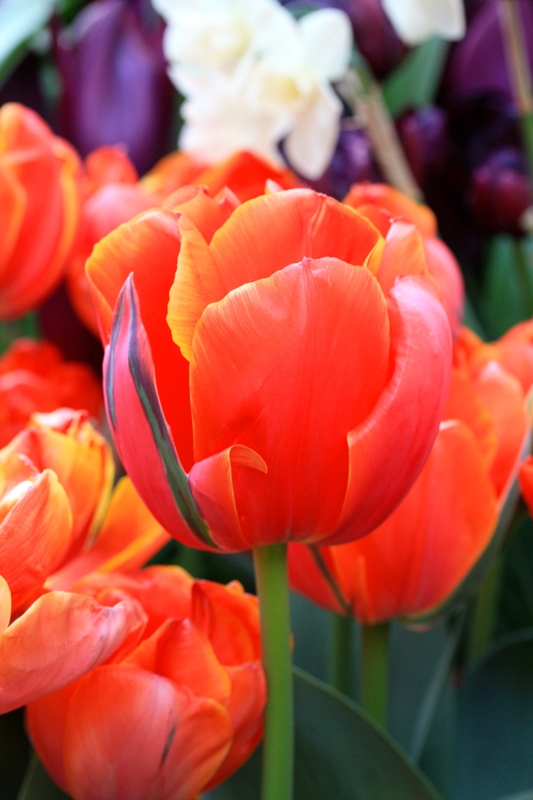 “Sunlover” looks like a fire-cracker of a tulip. Wonderful. I’ll keep an eye out for that one. I’m going to be a sunlover now and spend the whole day in the garden. The housework can wait! Thanks for the top of the pops chart of fab tulips! Will make a note for next year’s. Loved the blackboard collage of stems….it would make a terrific reference book page or a framed photo even! You’ve no idea how long it took me to get that right. I realise now why proper photographers have to much kit to help get the light right. I am very happy you felt it was worthy of comment, let alone framing! Have a great week. Fantastic review of your Top Spring Bulb List. 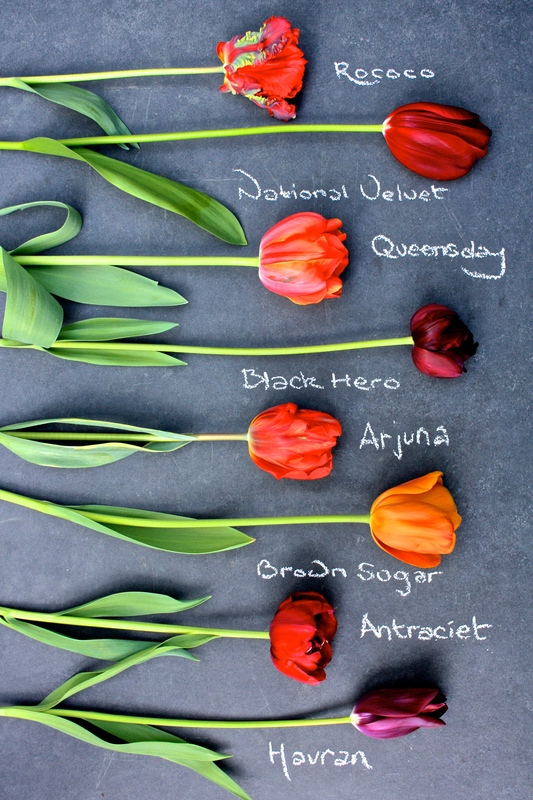 I like the the Brown Sugar and Queensday best. Hope to find their bulbs here in Poland in autumn. 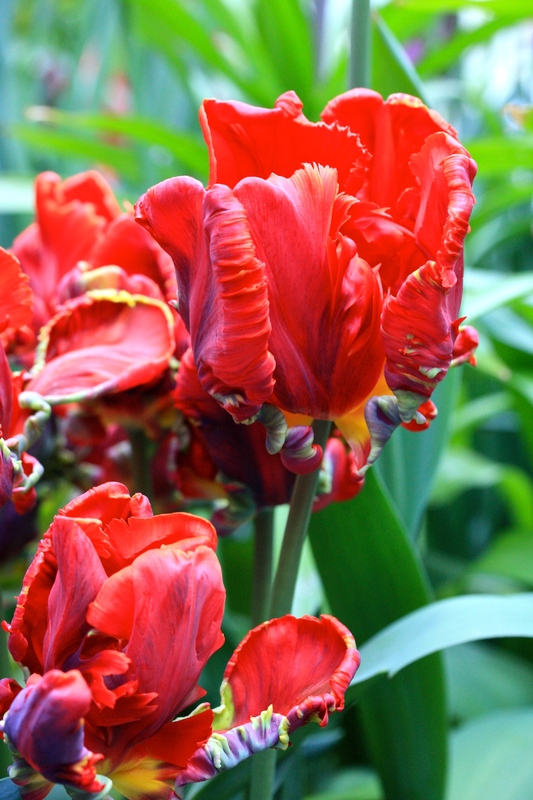 I still have some tulips blooming in my garden too – my favourite late ones are “Finola”. Due to the sad events of previous weeks in my family, I did not have the time or will to take any photos of them …Thanks for your pictures and great review. Have a nice week, Dan.Greetings, Paul. Floriferous. Rumbustiousness. Merriam and Webster would have loved your blog. Like your idea of intermixing the ferns. It will give the eye a place to rest. You are right. Our other garden in London is very restful at the moment, it’s almost entirely green! 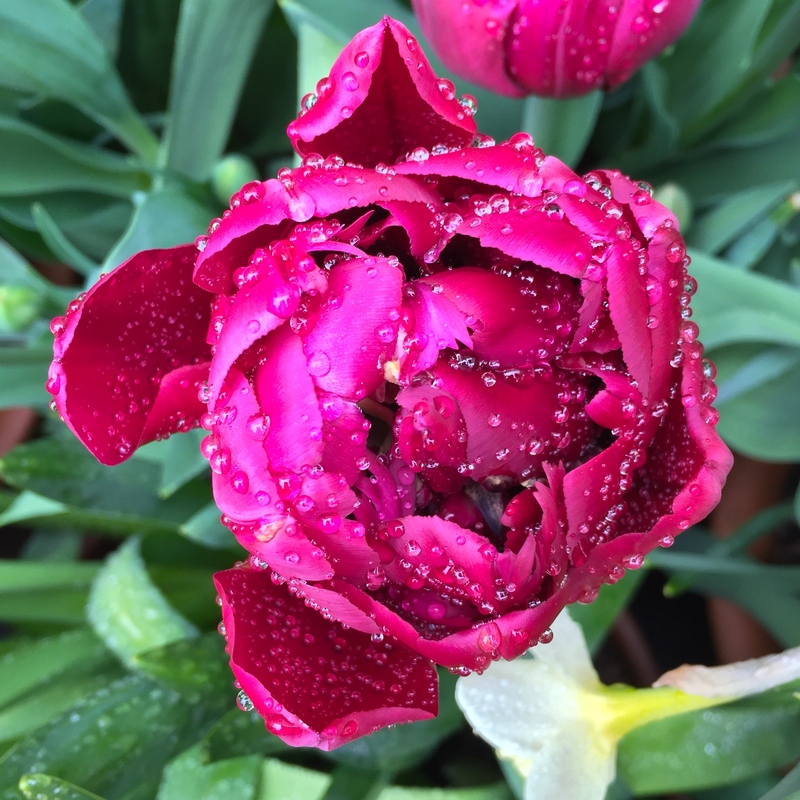 Being a relatively new gardener I have focused mainly on seeds so far and I never thought I was overly fussed on Tulips, but this blog post and the photographs have made me fall head over heels in love and I am now longing to have such beautiful displays in my garden too. Truly inspirational. Thank you. Well, that’s good news! In a sense a tulip bulb is not much more expensive or much more difficult to grow than, say, a bean. They are rarely worth keeping for a second season (unless you plant the right varieties in the right conditions) so are great to experiment with. I treat tulips very much like annuals and just enjoy them while they last. 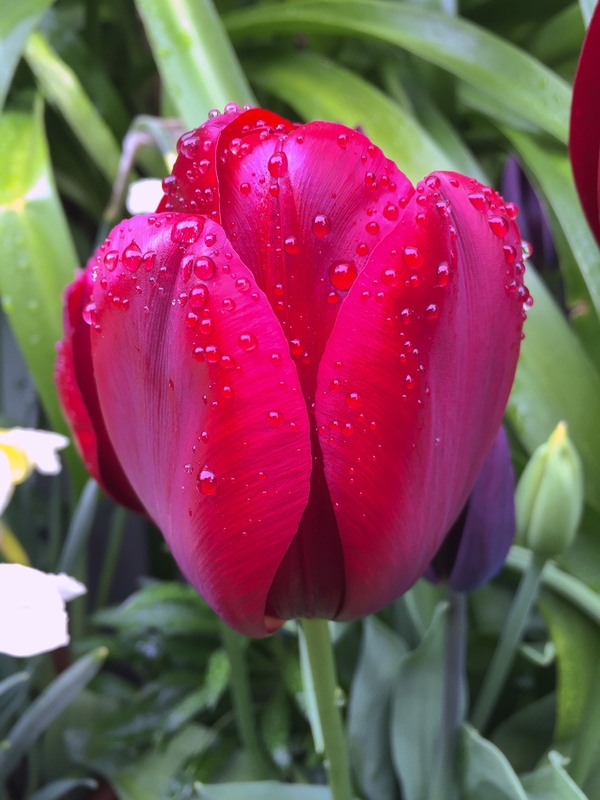 I know we have this shared passion for tulips and I too grew Queensway this year – not normally keen on doubles but the perfume was wonderful. I have been meaning to grow Brown Sugar so that’s on the list as is National Velvet and now I have seen Rococo unfurled – well – yet more planting next Autumn. Glad to see you mention Sarah Raven, fabulous catalogue, great website and also superb courses, I use her euphorbia oblongata to give that acid green colour. Great value all year through and fantastic for us flower arrangers. Mustn’t ever moan about a plant but on my Greensand soil I find it f seeds itself all over the place – looks fantastic at the moment with all those self sown forget me nots – a sea of blue and acid green – lovely. The muggy weather this week has been rather unexpected. I hate it, but the plants seem to love it. Good to hear a post of mine is worth reading twice! Thank you Robert.